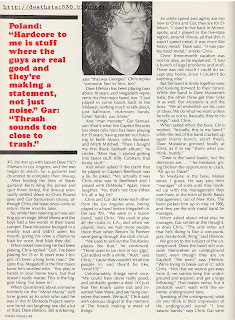 I've been getting requests from people asking about old magazine interviews with (insert band here). 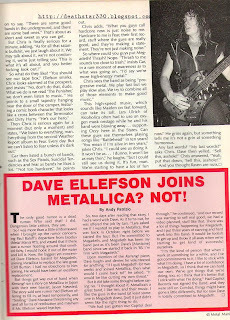 So one of the bands who people seem to really want to read about is Megadeth. I've been trying to get into the new Megadeth album, 'Endgame' for a few weeks now. It's not a bad record by any means, but it's extremely far from what I'd call excellent or great. Musicianship wise, it's beyond words. New guitarist Chris Broderick? Believe the hype. His axe-work is so good it's hard not to throw some big sounding adjectives his way, but the guy is, IMO responsible for the rebirth of Megadeth. 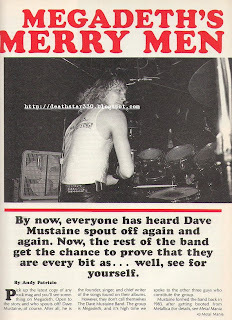 So here's an interview from 1986 with the other members of the band, at the time. ps: One year ago today, I launched this thing with this. Many thanks for the support to those who have supported!